An origin story, if you will, preceding Wonder Woman's placement on Themyscira by her creator, American psychologist William Moulton Marston (aka Charles Moulton). The story, unique as it is, is undermined here by filmmaking. More to the point, having seen the trailer, I'd inadvertently seen the entire film. This is always a disappointment, and increasingly common. I am glad, however, that I knew what I was getting into, but found the film repetitive and, in a word, boring. 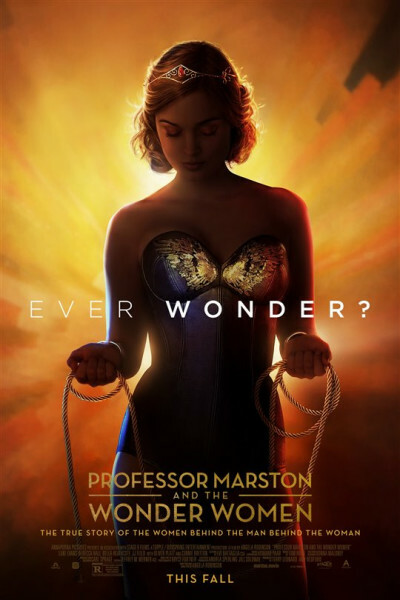 Sure, it's interesting to know Marston invented the lie detector, to see the origins of "DISC" theory, and to learn motivations behind the golden lasso, tiara, high-heeled boots, and a bustier-swimsuit combination. But WW's getup do not a story make, leaving the raison d'être wafer thin. As a love story, well, it's an ouroboros, destructively devouring itself for the longest time by lingering on unorthodoxy itself. I will not ruin the ending altogether, but was fascinated to read "38 years." Wow. That's a mighty long time. So there, we learned something new. Too bad it took an excruciating 01:48:00 to get there.